Chronicling a century and a half of the African American experience, African American Newspapers, Series 1, features 280 newspapers from 35 states, including many rare and historically significant 19th-century titles. These titles published for or by African Americans constitute valuable primary sources for researchers exploring such diverse disciplines as cultural, literary and social history; ethnic studies and more. Beginning with Freedom’s Journal (NY)—the first African American newspaper published in the United States—the titles in this groundbreaking series include The Colored Citizen (KS), Arkansas State Press, Rights of All (NY), Wisconsin Afro-American, New York Age, L’Union (LA), Northern Star and Freeman’s Advocate (NY), Richmond Planet, Cleveland Gazette, The Appeal (MN) and hundreds of others from every region of the U.S.
Access to over 130 digitised newspapers published by and for ethnic groups in the United States, particularly those of Czech, French, German, Hungarian, Irish, Italian, Japanese, Jewish, Lithuanian, Polish, Slovak and Welsh descent. Spanning the Early Republic’s Open Door Era to the Era of Liberalization in the mid-1960s, Ethnic American Newspapers from the Balch Collection covers two centuries of immigrant life in the United States. Nineteenth-century topics include the denial of citizenship to “nonwhites”; the founding of nativist political movements, including the anti-immigrant “Know-Nothing” party; the 1849 discovery of gold in California, which lured people from all over the world; New York City’s place as the world’s largest Irish city in 1860 with more than 200,000 Irish-born citizens; and the Immigration Act of 1882, which levied a tax on all immigrants landing at U.S. ports. In addition to the major contributions of immigrants to business, music, science, education, labor movements and war efforts, later topics include the Naturalization Act of 1906, which for citizenship required immigrants to learn to speak English; the 1921 Emergency Quota Act, which favored northern and western Europeans; the 1942 internment in “War Relocation Camps” of Japanese Americans, several of whom published newspapers; Truman’s 1953 Commission on Immigration and Naturalization, which revealed the positive impact of immigrants; and much more. Both collections are now available via SOLO / Databases A-Z. More news on US history resources in Oxford from the VHL Blog. Our wonderful colleagues in the Vere Harmsworth Library have also arranged permanent access to the eresource collection The War of 1812: Diplomacy on the High Seas. “We’re delighted that once again thanks to a generous donation, we now have access to another new eresource collection: The War of 1812: Diplomacy on the High Seas. Part of the Cengage Archives Unbound platform, this collection contains records and papers from the US National Archives and US State Department. 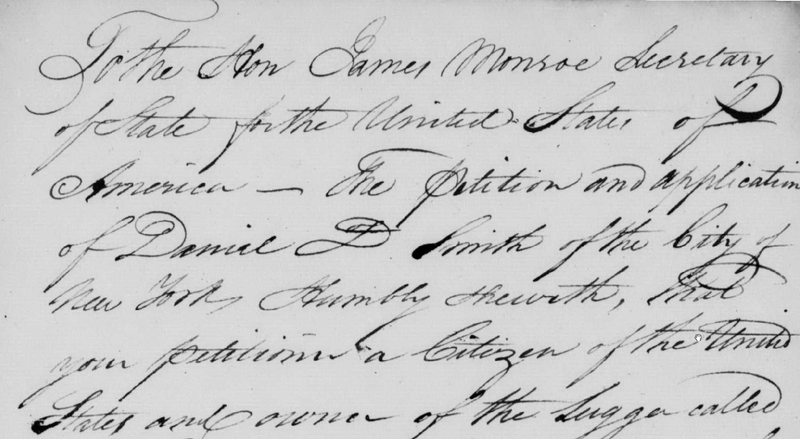 The bulk of these date from 1812-1814 and include letters of marque to private vessels engaged in the conflict, passenger lists, passport records, and correspondence relating to prisoners of war. Our colleagues in the Vere Harmsworth Library have arranged permanent access to the online The American Revolution from a British Perspective, 1763-1783. 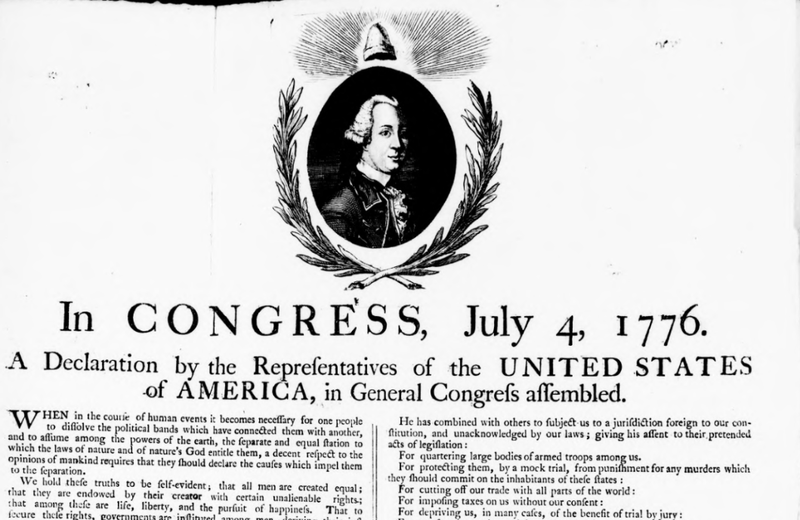 A collection of pamphlets published in Britain between 1763 and 1783 relating to American affairs and providing a British perspective on the American Revolution. “We’re delighted to announce that Oxford users now have access to all five parts of the American Antiquarian Society Historical Periodicals Collection from EBSCO. The collection provides digital access to the full text of thousands of American periodicals published between 1684 and 1912, digitised from the collections of the American Antiquarian Society. Titles cover a broad range of subjects and interests related to every aspect of American life and culture, from politics to religion, science, law, literature and the arts. More US historical sources online: Early American Imprints – Evans 1639-1800 and many more. See the American History LibGuide . The Vere Harmsworth Library has set up a trial to the full online American Antiquarian Society Historical Periodicals Collection. The trial ends Friday 8th February. The collection provides digital access to the full text of thousands of American periodicals published between 1684 and 1912, digitised from the collections of the American Antiquarian Society. Titles cover a broad range of subjects and interests related to every aspect of American life and culture, from politics to religion, science, law, literature and the arts. >>More information on the AAS periodicals collection. Access is available via OxLIP+ – use single sign-on for remote access. Please send comments and feedback to jane.rawson@bodleian.ox.ac.uk. 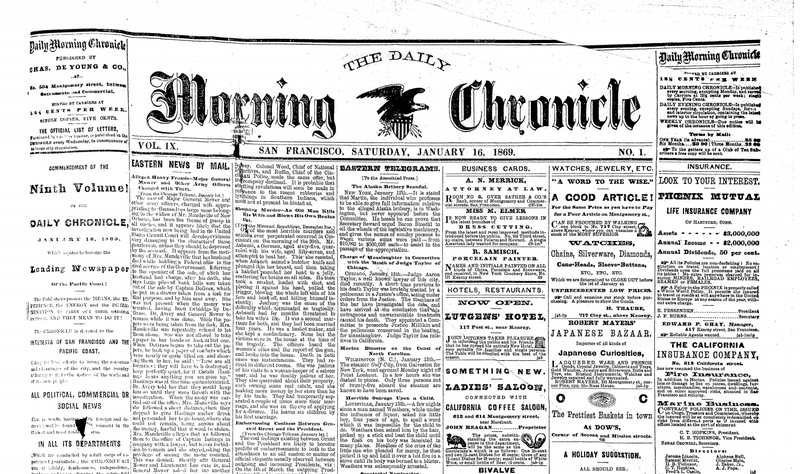 The Vere Harmsworth Library is running a trial of the San Francisco Chronicle 1865-1984. 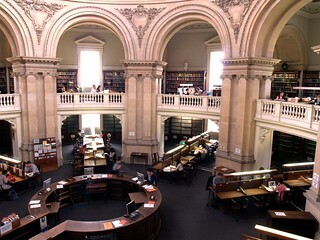 Researchers at Oxford are invited to explore it and send any comments or feedback to jane.rawson@bodleian.ox.ac.uk. I am delighted to announce that Social Science Library colleagues have subscribed to Gallup Analytics. It is now accessible via SOLO or Databases A-Z. Note that the subscription is limited to only one user at a time so here’s a plea to close your browser when you are finished or are going for a cup of tea so that others can access it. Gallup Analytics is a searchable resource of unique public opinion data and analysis compiled by Gallup, Inc. It includes answers to more than 125,000 questions, and responses from more than 3.5 million people interviewed in the Unites States since 1935. Gallup Daily Tracking (daily surveys across the US since 2008). Here is an example where I’ve asked for mapped EU responses in which EU country immigrants would find a “good place”. Comparing it to 2016 makes a very interesting comparison! European Views of the Americas: 1493 to 1750 is a freely accessible comprehensive guide to printed works about the Americas written in Europe before 1750. It is provided by EBSCO. The database contains more than 32,000 entries and is a comprehensive guide to printed records about the Americas written in Europe before 1750. It covers the history of European exploration as well as portrayals of Native American peoples. There is good content from continental Europe. You can locate material by searching in a variety of ways or browsing for publication (A-Z) or name and geographic lists of publishers, printers and booksellers. 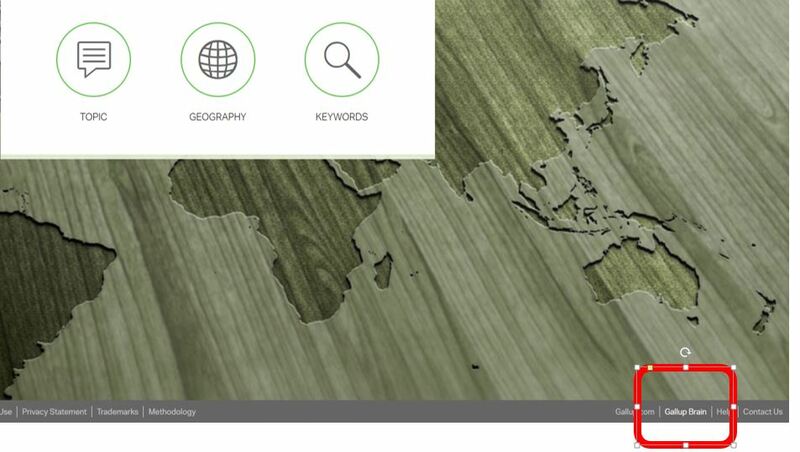 You have a good choice of saving and exporting your citations with permalinks and citation assistance also provided. Together with the Vere Harmsworth Library, we have organised a trial to America and Great Britain: diplomatic relations, 1775-1815. Oxford readers can access it via SOLO or OxLIP+. This resource is the digitised Cambridge Archive Edition 9-volume set of facsimile British diplomatic primary material, charting the emergence of an independent United States and comprising diplomatic correspondence between America and Britain. 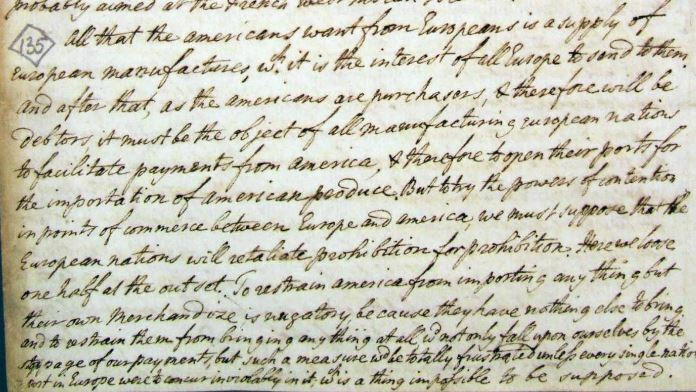 It provides access to diplomatic and official correspondence between America and Britain and gives a good insight into the shaping of a nation, from America being referred to as ‘our Colonies and Plantations in North America’ by the King, to its recognition as the ‘United States’ by Britain in 1782. The correspondence is formed of diplomatic letters between the British Government and American officials including Benjamin Franklin, George Washington, James Madison, John Jay and John Hancock. The collection begins with a résumé of events centered around American protests over taxation, follows the course of the War of Independence, and concludes, after ratification of the Treaty of Ghent in February 1815, with the restoration of normal diplomatic relations.Together these correspondences form a narrative which not only captures major historical events from a contemporary viewpoint, but also provides a vivid, lively and uniquely personal insight into the creators of modern America. The archive is a valuable tool in understanding an era of modernization in diplomatic practises. With the expansion of the British Foreign Office, there was a movement away from the era of the aristocratic amateur towards a more tightly controlled process, where professionalised servants of the British Crown filed regular despatches from across the world to a rigid procedure. The collection also provides an insight into European politics during this period. Conflicts between America, France and Britain arising over trade, defence and diplomacy are explored and increase our understanding of this complex trans-Atlantic triumvirate. Feedback to isabel.holowaty@bodleian.ox.ac.uk or jane.rawson@bodleian.ox.ac.uk. The VHL have organised trial access to Readex’s Civil Rights in America: from Reconstruction to the Great Society until 22nd April. 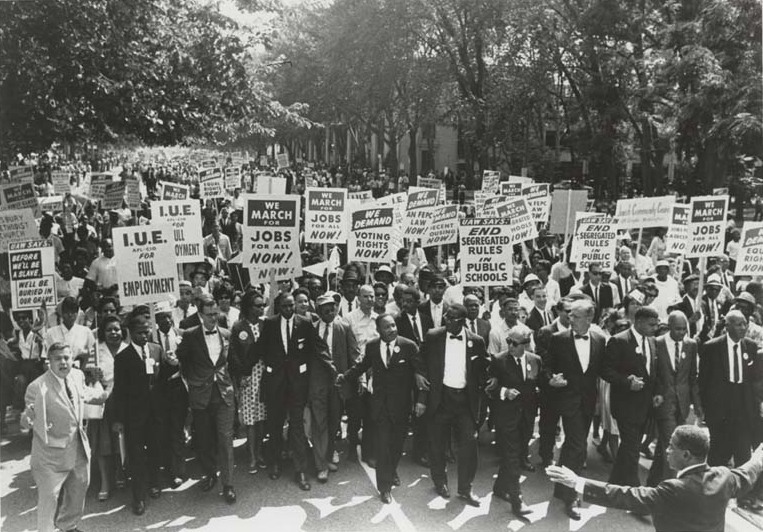 Civil Rights in America is a fully searchable archive of congressional documents related to all aspects of civil rights in the United States, from segregation to women’s suffrage to discrimination of all kinds. The material in this collection includes publications and reports from the US Senate and House of Representatives, the executive branch, congressional committees, special investigations and non-governmental organizations. Please note, there will be significant overlap with our existing congressional resources such as the Serial Set. Access is available via OxLIP+ until 22nd April 2016 (use single sign-on for remote access). Please send feedback to jane.rawson@bodleian.ox.ac.uk.